Since the announcement of its impending release, there has been an air of incredibility surrounding the very idea of a solo title starring Vibe. Maintaining relevance in the modern day as a joke, even decades after his time had come and gone, the once dancing machine of justice now tries to step out of the mocking shadow of his past with the partial guiding hand of a creator well-versed in salvage work; Geoff Johns. And while Johns and Kreisberg have both shown they are talented in their own ways, even I was skeptical of their abilities to make this character interesting; a pre-judgement that I am elated to admit I was entirely wrong about. Beginning 5 years earlier, at the onset of the Apokaliptan invasion, a young Francisco Ramon finds his life forever altered by the events that unfold one afternoon. Dealing with the consequences over the years that follow, Francisco is offered the opportunity to possibly save others from the horrors that he experienced; as both a guardian to our world from inter-dimensional threats, as well as a founding member of the Justice League of America. But all is not as it seems, and Vibe may have found himself in a game of subterfuge that he cannot even begin to comprehend. I was so angry when I put this book down. Not because it was bad, entirely the opposite in fact, but because it meant I had to redo my pull list yet *again* to accommodate this new title after my expectations had already written the title off as not being aimed to my tastes. Johns and Kreisberg do a splendid job on multiple facets in this introductory chapter to the unlikeliest hero; tying his background and origin to the new history of the world, creating an empathetic core to build the character off of, and probably most important, giving him an interesting role to fill that is relevant to the DC Universe at large. I was going to be surprised if even one of those items occurred, let alone all three with this initial issue. 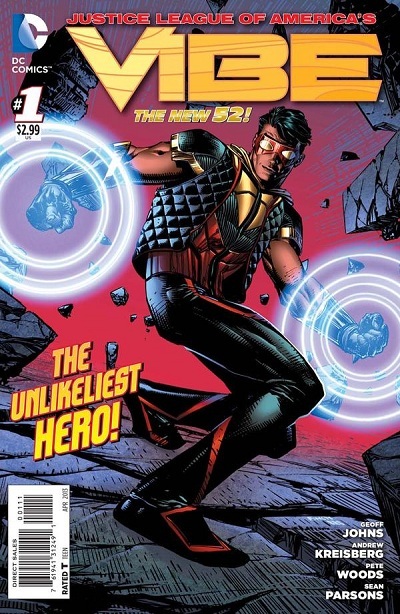 Without going into spoiler territory, it is evident that there are big plans in motion behind the scenes for Vibe, and the next few issues will be critical on determining if this is a semi-necessary companion title to JLA, or if it will be its own beast tackling an angle of the DCU that will have larger ramifications. Artistically, Woods works fantastically at creating a down-to-earth feeling to a book that I fully expected to either go cartoonish or overly-grim to compensate for the character. Dodging both of those pitfalls, his artwork is successful in delivering an atmosphere that feels dramatic, adventurous, and even menacing when dealing with the covert machinations that our protagonist is blissfully unaware of. With minimal action in this first issue, the brief scene of fighting does show promise, and I am interested to see how he is able to handle the flexible character in motion. Without a doubt though, the emotional resonance is there, and no matter which direction the title ends up going, that will be a major asset. A surprising Buy! While I will wait a few issues before hailing the creative team as conquering heroes in resurrecting this once-derided character, this first chapter is off to a great start in making Vibe a fun, exciting, and amazingly relevant title within the stable at DC Comics. But for this particular issue, if you are on the fence, give it a try. And if you had no interest before, you may want to give Vibe a second glance; because he may just air flare his way into your heart.